BEACHWOOD - A volunteer committee of community members has selected eight Beachwood High School graduates for induction into the 11th class of the Beachwood High School Gallery of Success. The induction ceremony - an all-school assembly open to the public - is Friday, April 7, 2017, 10 AM in the new auditorium at Beachwood High School. 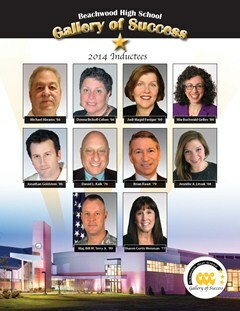 This induction class brings the total number of Gallery members to 129. The Gallery of Success began in 1985. Nominees must be Beachwood High School graduates whose accomplishments since high school make them outstanding role models for our students. They must exhibit achievement and distinction in one or more of the following criteria: leadership, service, humanitarianism, creativity, courage, and/or career contributions that have benefitted others. 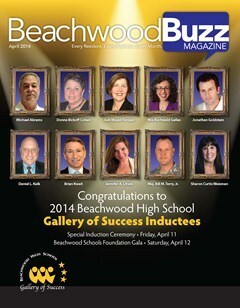 Inductees were selected by a committee representing a cross-section of the Beachwood community. Selection committee members included alumni, previous Gallery inductees, community members, teachers, staff, and current students: Harlin Adelman (BHS ‘83), Sherry Bogart, Lisa Brockwell, Jim Cowan (BHS ‘61), Emily Einhorn (BHS ‘17), Judi Feniger (BHS ‘69), Steve Hacker, Superintendent Robert Hardis, Theresa Haynesworth, Midori Hitomi, Domenick Iammarino, Jamie Lader (BHS ‘92), Julie Millstein (BHS ‘80), Stuart Ostro (BHS ‘04), Priya Rajgopal, Joel Ratner (BHS ‘82), Swathi Srinivasan (BHS ‘17), April Thomas (BHS ‘92), Mike Zawatsky, and Andrew Zelman (BHS ’01).